Shoegaze, Dream pop, Post rock. The more I think about it, while giving another and another listening to “Walls vs. Love”, I think I need to think harder for the right words to type on this review. 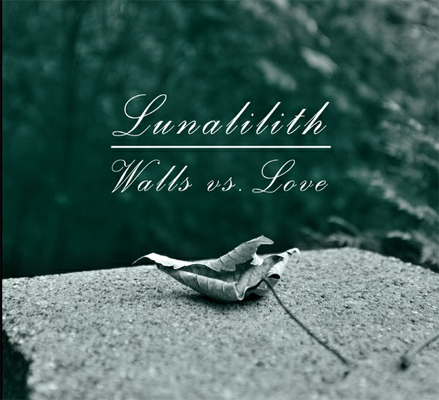 “Walls vs. Love” is the second album for LunaLilith, a project that was created by Irina and Ralli who work together to form an excellent release that can take the listeners by surprise as it surfaces lots of distant memories. From the first piano strokes on the first track, those of the right age can immediately recall the days when we were excited to hear the new Cocteau Twins album for the first time, or drown our sorrow with other albums from the its ethereal label, 4AD. Indeed, “Walls vs. Love” does sound like a proper and worthy release from the good ol’ times of the famous releases by 4AD, especially on the moments when Ralli and Irina are focusing on the more melancholic side of their music. This flattering resemblance aside, one needs to keep in mind that Lunalilith uses its own view and approach instead of just ripping off some successful melodies from the past. As songs pass, you get to understand the delicate layered compositions and the wondrous mood that is produced by this duo. As the album plays for yet another time, you learn to appreciate their music for what it is, a gentle, dreamy blend of gloomy visions and optimistic thoughts. As Irina whispers in the foreground, her voice is grows distant and enchanting. Her Ladytron-like soft and alluring whispers take the music to higher places, especially when accompanied by a piano, like on the song “Nothing but lies”. Sometimes her voice comes in direct contrast with the music and this clash gives birth to some very touching moments. “Out of time and space” is such a moment, putting Irina in the place of a naïve little girl, singing in front of a heavy wooden bar piano. When Ralli enters and sings as well, he gives a firm opposition to Irina, as he sounds much more grim and severe. Together they deliver powerful moments, with the song “Little fool” serving as an example for this. “The Devil’s got a hold on me” is another highlight, perhaps the best song on the album, with Ralli’s voice tormented and torn alongside that same dark bar piano. Irina won her confrontation with that piano when she outshined the dark sounds; Ralli wins his way when he yields to them. Overall, each of the tracks brings a great moment and you can hear that there was a great work on this production. Any person interested in the relevant musical genres will find “Wall vs. Love” to be a very appealing work, taking part in the encounter between Irina and Ralli, and listening to their dreamy, enchanting conversation.